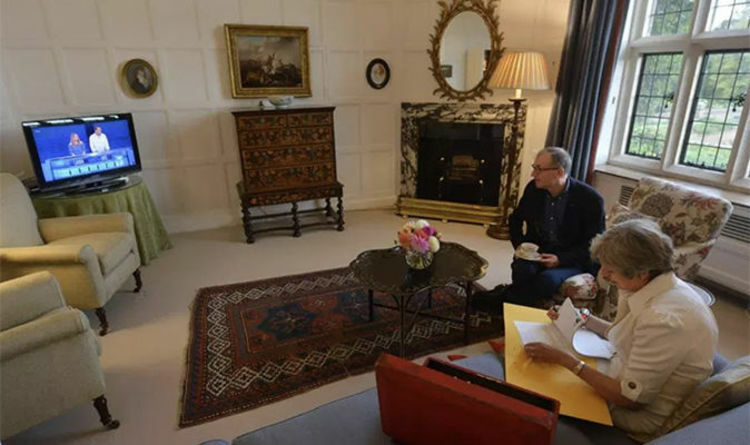 In a new documentary, Mrs May can be seen putting her feet up with a cup of tea while juggling work from her red box and the telly favourite, presented by Bradley Walsh. The couple, who this month celebrated their 38th wedding anniversary after meeting while studying at Oxford, also enjoy watching rival quiz programme Eggheads according to the Panorama documentary by the BBC to be aired tonight. Mrs May, 61, has previously credited her husband, 60, for helping her through the sudden death of both her parents when she was just 25. Shortly after her wedding to investment manager Philip in 1980, her vicar father Hubert Brasier was killed in a car accident. Her mother Zaidee died months later from multiple sclerosis. Referring to her parents on Sky News, she said: “I have had quite a lot of letters from people who have known me over the years and knew my family, who said how proud my parents would have been. Tonight’s documentary gives a rare insight into Mrs May’s personal life, something she has kept under wraps since becoming prime minister in 2016. Other aspects of her private life she discussed in the past are what household jobs they share. Speaking again to Sky News, she said she loves to cook and has more than 100 books on the subject while Philip has “one or two recipes that he can rustle up himself”. When asked what the naughtiest thing she had ever done was, her answer was typically tame. She told ITV: “Well, nobody is ever perfectly behaved, are they? “I mean, you know, there are times when… I have to confess, when me and my friend, sort of, used to run through the fields of wheat. Mrs May who has also described herself as a “goody two shoes”, also said she was “bookish” as a child and “enjoyed learning”, which would explain her love of quiz shows. Mrs May could face a gruelling leadership challenge at the Conservative Party conference on September 30 having told her cabinet they will have to decide between her proposed deal with the EU that will keep Britain in the bloc’s customs union and single market, or no deal at all. Inside No 10: Deal or No Deal? is on BBC1 at 8.30pm.